It's hard to imagine this diminutive, celibate octogenarian being the dynamo behind an entire popular movement. But in India, Anna Hazare cut a Gandhian pose that transfixed the world's largest democracy and put its sitting government's feet to the fire. 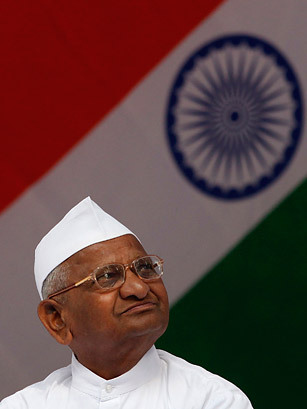 Hazare's repeated fasts against corruption attracted tens of thousands of supporters and paralyzed India's Parliament. While critics spy corruption within his own ranks and point to Hazare's ties to the Hindu right, his protest channeled the widespread exasperation and anger of India's rising middle class, frustrated with the age-old habits of graft that still dominate much of India's calcified bureaucracy. Corruption is endemic throughout Indian society, but high-profile scandals implicating key figures in the government of Prime Minister Manmohan Singh meant much of Hazare's ire was directed at the top. A bill he and his supporters are pushing would install a national anti-corruption ombudsman that could even call the once immune Prime Minister into the dock. Hazare, a former military man who spent much of his life helping govern his tiny village in western India, summed up his 2011 in a recent interview with TIME: "I am still bemused as to how this all came about. A pauper living in a temple, who has no money, no power, no wealth; for him the entire country united and spoke in one voice."